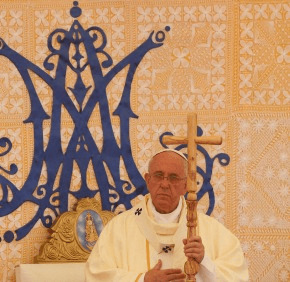 CAACUPE, Paraguay – Pope Francis was as close to home as he has been since becoming pope in March 2013 as he celebrated Mass at Paraguay’s popular shrine of Our Lady of Miracles of Caacupe. Only 25 miles from the border with Argentina, tens of thousands of Pope Francis’ fellow Argentines filled the square in front of the shrine and the streets around it July 11 to pray with “their” pope. While not expected to be the biggest or the most important event during the pope’s July 10-12 visit to Paraguay, the Mass highlighted his affection for the Paraguayan people and, particularly, for their cultures and popular religiosity. At the Mass — and during an evening meeting July 10 with government officials and diplomats at the presidential palace in Asuncion — Pope Francis expressed his admiration for Paraguayan women. They are credited with keeping the country going during and after the war of 1864-1870, a disaster for Paraguay in which the majority of the country’s men died. “The women — wives and mothers of Paraguay — at great cost and sacrifice were able to lift up a country defeated, devastated and laid low by war,” the pope said. The Mass and other papal events were celebrated in Spanish and Guarani, a native language. The vast majority of the nation’s people are of mixed Spanish and Guarani heritage and most of the population speaks both languages. The papal visit had begun with a tribute to St. John Paul II, beloved by many Paraguayans as a world leader who stood up to Gen. Alfredo Stroessner, who ruled the country for 35 years. The dictator was overthrown by a military coup in 1989 and the process of consolidating democracy and building national unity continues. “I wish to pay tribute to the many ordinary Paraguayan people, whose names are not written in history books but who have been, and continue to be, the real protagonists in the life of your nation,” the pope said July 10 during the evening reception at the presidential palace. After the speeches that evening, the pope and the invited dignitaries were treated to a concert. The program, “The Voice of God in the Selvas of Paraguay,” featured a selection of baroque music traced to the so-called “Jesuit reductions,” the missions run by Jesuits in Paraguay and neighboring countries from the early 1600s to 1767. The concert included music from the film “The Mission,” which recounts the story of the reductions. During a rousing meeting July 11 with “representatives of civil society” — teachers, artists, business leaders, communications professionals, indigenous leaders and farmers — Pope Francis said he was impressed by the variety of groups and their commitment to working for the common good. Simon Cazal, co-founder of Somos Gay, a homosexual rights group in Paraguay, was among those invited to attend the meeting. He told the British newspaper the Guardian that he hoped the invitation would make Paraguayans more tolerant. Responding to questions from a young man, an indigenous man, a woman who farms, a businesswoman and a public official, Pope Francis added notes to his prepared text and tried to be concrete in his suggestions for moving the nation forward. With President Cartes and members of his cabinet sitting in the front row, Pope Francis insisted that trading votes for favors — “something that happens in every country” — is a form of corruption and will hold the country back. Progress requires creating culture of encounter, he said, and that comes only from recognizing that all people are children of God and, therefore, brothers and sisters to one another. “True cultures are not closed in on themselves, but called to meet other cultures and to create new realities,” he said. “If someone thinks that there are persons, cultures or situations which are second, third or fourth class, surely things will go badly, because the bare minimum — a recognition of the dignity of the other — is lacking. Turning to the question of economic growth, Pope Francis insisted that a morally correct economic life puts people before profits. Those blessed with the ability to promote economic development — business owners, entrepreneurs and government officials — have a responsibility always to keep the needs of real people in mind, the pope said. “A more humane society is possible,” the pope said, pointing to the experience of the Jesuit reductions.